Members of the UT community gathered in Vaughn Courtyard March 14 to take part in the nationwide Walkout to honor the victims of the Parkland shooting and stand together against gun violence. 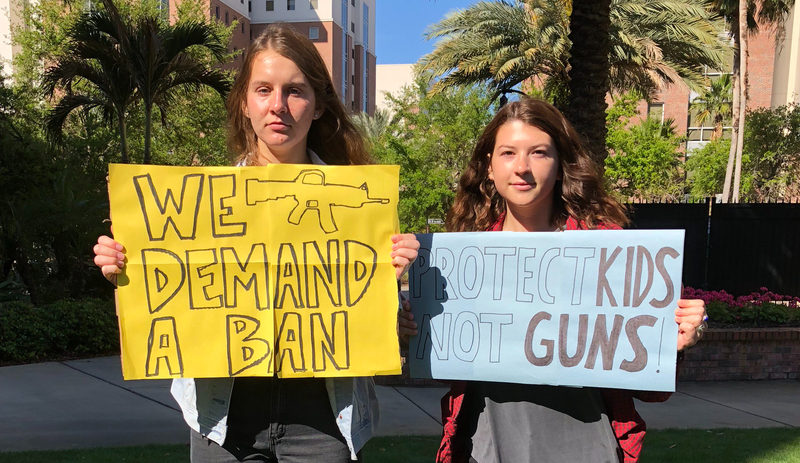 The Walkout was organized by the UT College Democrats, NextGen Florida and. In addition, Philosophy Club, Spartans Seeking Justice, Tampa Spartans For Animals, and PEACE promoted the event at meetings and tabling. The Walkout consisted of students walking out of class at 10 a.m. and meeting in Vaughn Courtyard. In the event, which was being held by different schools and universities across the United States, 17 minutes of silence for the 17 victims who lost their lives in at Marjory Stoneman Douglas High School took place. Since the beginning of this year, the United States has had 17 school shootings in which one or more people were injured or killed. Being 11 weeks into 2018, this averages to 1.5 shootings per week. On the morning of the event, the Provost sent a global email to UT students letting them know that even though it was their right and their decision to attend the Walkout, it would not be counted as an excused absence. Stephanie Krebs, the dean of students, reached out to the Provost David Stern, about the email. In his response, Stern said that both faculty and students had wondered about the event and how it was going to affect the attendance policy. “The university supports civic engagement by students, but we also have academic policies that we follow and which all are responsible for understanding,” Stern said. “The global message encouraged participation by those who were interested in the walkout but made clear that missing class to do so is not an excused absence. For her part, Krebs, who also attended the Walkout, said she was proud of the student organizers and that she believed the event was meaningful for those that chose to attend. “I was impressed with the combination of the 17 moments of silence in remembrance of each victim of the Marjory Stoneman Douglas High School shooting as well as the opportunities for future action through civic engagement, specifically voter registration,” said Jennifer Scaia, dean of student conduct. Scaia said she attended the event in support of UT students and the healing community of Parkland, FL. She said she supports the cooperation between the Office of Student Leadership and Engagement and the student leaders, which resulted in the Walkout. Paz also said that she was grateful for the organizers and for the speakers who shared their points of view at the event. For his part, Bauer hopes that this does not become a partisan issue and that people do not forget about what was talked about in the event. There will also be a nationwide march, March For Our Lives, to advocate for reforms on gun control on March 24. You can reach Indira Moosai and Alexandra Tirado at indira.moosai@theminaretonline.com and alexandra.tirado@theminaretonline.com.